Think about your medicine cabinet at home for a minute. Do you have prescription drugs left over, maybe pushed toward the back of the cabinet and forgotten? A great way to get rid of them is coming up on Oct. 27 from 10 a.m. to 2 p.m., the semi-annual Drug Enforcement Administration (DEA) Take Back. Your disposing of your prescription drugs at this event ensures they can’t fall into the wrong hands. The DEA Take Back is one of our prevention coalitions’ favorite activities. This event happens in communities all over East Texas and the rest of the country. Local law enforcement set up come-and-go collection sites where residents can drop off their leftover prescription medication, no questions asked. Residents who come to drop off their drugs almost always thank the law enforcement for holding this event, and often say they wanted to dispose of their leftover prescription drugs but weren’t sure how. To see Takeback locations in your area, check out the DEA Take Back site. How did the opioid crisis get started? According to the Centers for Disease Control and Prevention (CDC), 72,000 people died of drug overdoses in 2017, and the number of deaths has climbed every year since opioids started to be prescribed in the 90s, with the total deaths now more than 600,000. What is the scope of the problem in East Texas? According to the Regional Needs Assessment, controlled substances (prescriptions that have a higher potential for abuse) are prescribed at a higher rate in East Texas than the rest of the state, and that access contributes to the fact that teens in East Texas abuse prescription drugs at a higher rate than their peers across Texas. How does having leftover pills in your cabinet contribute to the crisis? The opioid crisis has been in the news a lot lately, and Americans are beginning to understand the impact of leftover drugs sitting in their medicine cabinet. Whenever teens who abuse prescription drugs are surveyed, the majority say they get them for free from friends and family — and sometimes take them from a loved one without their knowledge. Not to mention that prescription drugs are sometimes taken when a burglary occurs to either be consumed or sold for a big profit. When you dispose of your prescription drugs responsibly with law enforcement, you are not only protecting your teen or another loved one from potential misuse, but also protecting the community. 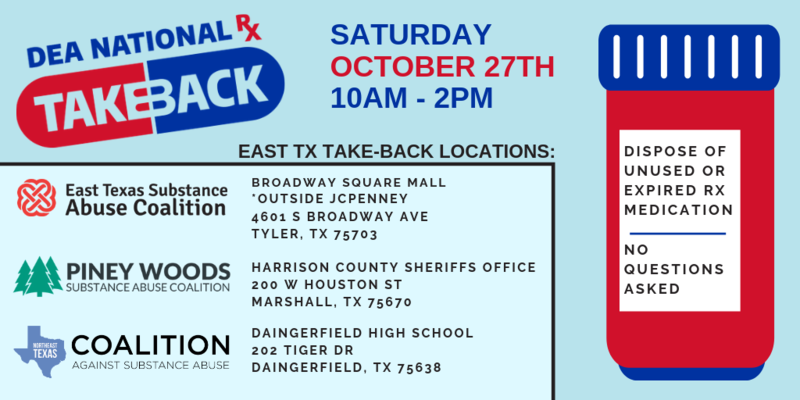 If you can’t make it out to the National Rx Drug Tack Back event from 10 a.m. to 2 p.m. on October 27, check out our How To Dispose page for other ways to safely get rid of your medications. With opioid overdoses being so frequent across the country (115 Americans die every day, according to the CDC) and in the news lately, parents may be concerned if their child receives an opioid prescription. Here’s some tips on how to ensure that your child gets the pain relief they need while avoiding opioid misuse and addiction. First, what is an opioid? There are several opioids that are on the market now. The most common are Hydrocodone (Zohydro); Hydrocodone with Acetaminophen (Vicodin); Oxycodone (Oxycontin, Roxicodone); Oxycodone + Acetaminophen (Percocet); Codeine, Morphine, Fentanyl, and Tylenol with codeine. These are distinct from opiates; opiates are drugs like morphine and heroin that are derived from the poppy plant, whereas opioids are synthetic, but they create a similar high. This is why 4 out of 5 heroin users say that their addiction began when they started abusing prescription drugs. On top of that, teens have a brain that is not fully developed. The part of the brain that assesses risk isn’t fully finished developing until about the mid-twenties, which means that teens are more susceptible to trying substances. What should you ask your child’s doctor? What other steps can you take if an opioid is prescribed? First and foremost, be sure and talk to your kids about the dangers of taking a medication in any way other than the way it’s prescribed. Medication, especially opioids, should never be taken at a higher dose or more frequently than prescribed. As with any medication, especially ones that have a high risk of being misused, consider securing it behind a lock. If that’s not possible, keep track of how much medication you have. Once your child is feeling better, dispose of any leftover medication right away. There are several ways to properly dispose of leftover medication, such as attending a DEA Takeback event that happens twice a year, dropping the medication in a secure drop box at a participating law enforcement agency or pharmacy, using a drug deactivation pouch, or mailing in your medication to an agency that will incinerate it for you. Opioid addiction can be a scary thought, but following these steps will go a long way to keeping your family safe. Maybe you’ve heard about “The Opioid Crisis” in the news. It is one of the biggest public health epidemics of our time. According to the CDC, from 1999 to 2016, more than 630,000 people have died from a drug overdose. Around 66 percent of the more than 63,600 drug overdose deaths in 2016 involved an opioid. 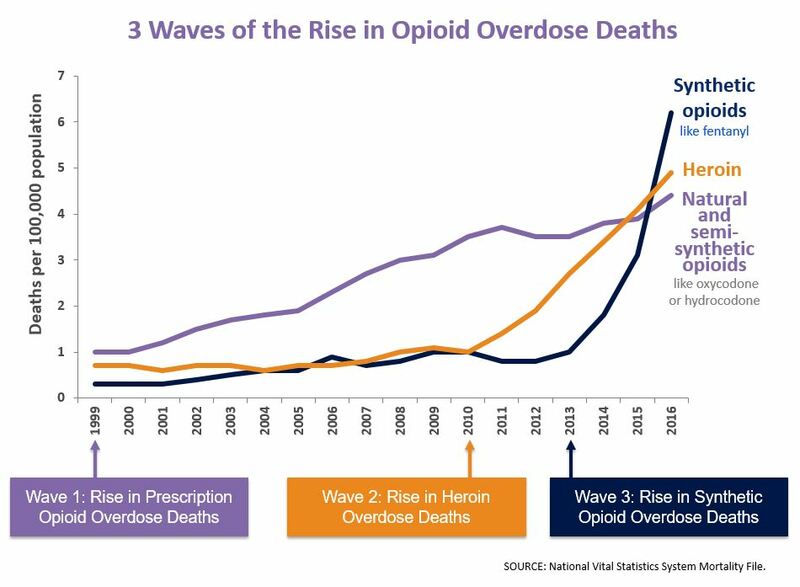 In 2016, the number of overdose deaths involving opioids (including prescription opioids and illegal opioids like heroin and illicitly manufactured fentanyl) was 5 times higher than in 1999, and on average, 115 Americans die every day from an opioid overdose. Because there are so many drugs out there, part of how to prevent the problem from getting worse is to properly dispose of leftover prescription drugs that are no longer needed, and not saving them for a rainy day. There are several ways you can dispose of your prescription medications and keep them from falling into the wrong hands. One, use a prescription drug drop box if one is available in your community. These are a great option because the drugs are incinerated by law enforcement, keeping them out of landfills and the water supply. Here is our list of those boxes in East Texas. Two, participate in the twice-annual DEA Takeback event. The event is typically held in April and October every year. Three, use a prescription drug pouch that will deactivate the drugs if one is available to you. Ask your pharmacist about other good ways to dispose of your prescription drugs. One of the best ways to combat the opioid crisis and prescription drug abuse is to ensure that prescription drugs aren’t easily accessible. People are coming up with new ways to do that every day, and now even Google is getting involved. “We’re deeply concerned by the opioid crisis that has impacted families in every corner of the United States,” reads Google’s blog post announcing their efforts to combat the crisis. “We started by thinking about how to bring Google’s technical expertise to help families combat the epidemic. Google used their search engine to help people locate DEA Takeback events this past Saturday, and are working with individual states to locate more permanent drug takeback options, such as drop boxes at participating local law enforcement agencies and pharmacies. Until then, here is our list of locations in the East Texas area. In addition, Blue Cross and Blue Shield of Texas is partnering with Walgreens to provide prescription drug drop boxes in Walgreens locations across Texas. These are wonderful initiatives, but the essential part of the equation is you: If you have leftover prescription drugs, please make sure you do your part and dispose of them properly. What is a prescription drug disposal pouch? It’s a simple idea: When there are fewer drugs in medicine cabinets, people are less likely to abuse them. That’s the thought behind prescription drug disposal tactics such as disposal boxes (click here for a list of locations in East Texas where you can dispose of your leftover prescription drugs, no questions asked) and prescription drug disposal pouches being distributed in communities in our 3 coalitions 13-county coverage area. The East Texas Substance Abuse Coalition covers Smith, Rusk, Cherokee, Henderson, and Van Zandt counties. The Piney Woods Substance Abuse Coalition covers Gregg, Harrison, and Marion counties. The Northeast Texas Coalition Against Substance Abuse covers Franklin, Titus, Morris, Cass and Bowie counties. 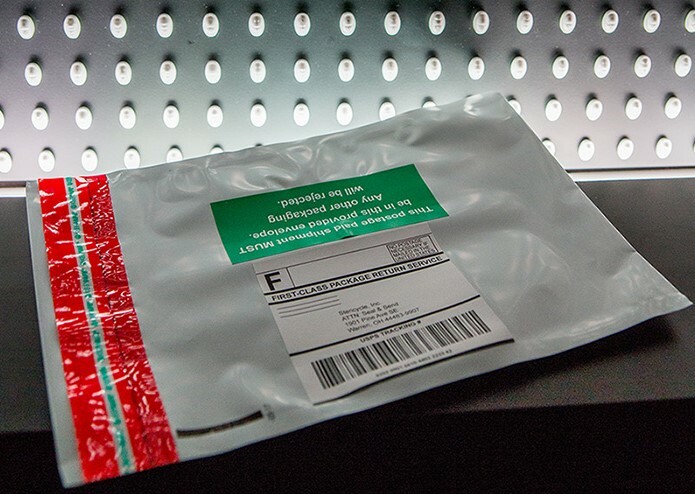 The prescription drug pouches were awarded to the coalitions from the Texas Targeted Opioid Response grant. The opioid crisis has been in the news a ton lately, and for good reason. According to the Centers for Disease Control, 115 people die every day from opioid overdose. There is a massive amount of these drugs out in the community, making them readily available for would-be abusers. More opioids are prescribed in East Texas than the average rate for the state, and the rate of calls to poison control for opioid exposures is higher in East Texas than the rest of the state, according to the Regional Needs Assessment by the Longview-based Prevention Resource Center. In 2015, doctors prescribed “enough painkillers in the U.S. to keep every American doped up around the clock for three weeks straight,” according to NY Daily News. Our coalitions are encouraging residents to dispose of these drugs once they are no longer needed. Enter: the disposal pouch. There are a few options on the market, but the pouch the coalition is distributing are very easy to use. Simply drop the drugs into the pouch, fill it up halfway with warm water, reseal it and throw it in the trash. The charcoal inside the pouch makes the drugs inert and the pouches are landfill safe. This is a much safer, more effective option than simply throwing drugs directly into the trash or flushing them down the toilet. Whether you use a prescription drug drop box or a disposal pouch, you are doing a service to your community when you dispose of your prescription drugs properly. If you are a Brookshire’s pharmacy patient, specific Brookshire’s pharmacies are giving out these pouches. Click here for that list. And if you are a Walmart patient, any Walmart pharmacist will happily provide you with their own disposal pouch.